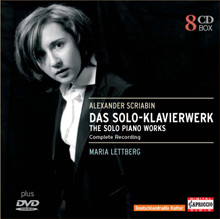 This box is a brand new item in our catalogue: the young Swedish pianist Maria Lettberg plays the complete piano works of the brilliant, eccentric and short-lived Russian composer Alexander Scriabin on eight CDs. His music is rooted in the romantic tradition of Chopin, but Scriabin developed his own increasingly independent tonal language and incorporated philosophical theories into his boundless universe. On the bonus DVD, you can experience fascinating visualisations of Scriabin’s music – the composer associated his music with colour progressions, here realised by the designer Andrea Schmidt.